The San Jose Blog: San Jose Gets a Piece of Super Bowl 50! San Jose Gets a Piece of Super Bowl 50! Since it was announced that Santa Clara would host Super Bowl 50 at Levi's Stadium next year, it was expected that the city of San Jose would receive some of the benefits as well. After all, our city is a lot closer to the game than San Francisco. San Jose hotels, tourist attractions, and entertainment venues will all do quite well during Super Bowl week. The good news is that the benefits are going to extend beyond that. A few weeks ago the Super Bowl 50 Host Committee confirmed that one of the teams will be headquartered at the Marriott Hotel in Downtown San Jose and practice at Spartan Stadium. 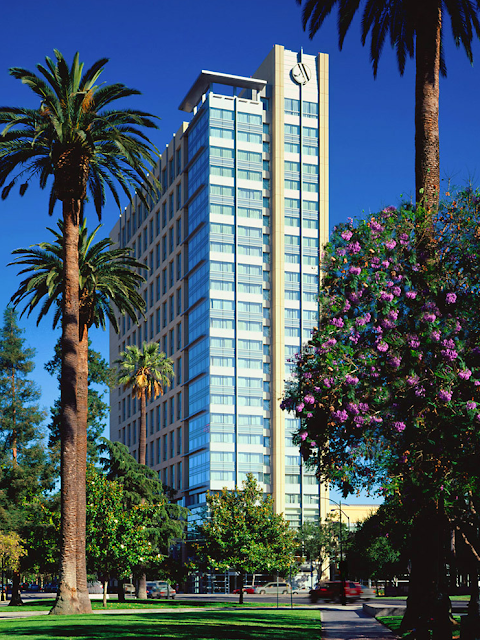 The team will literally be living in Downtown San Jose for the whole week. The hotel is right next to the San Jose Convention Center, The City National Civic, and The Montgomery Theater... I think the odds are quite good that the team will plan some events in the area much like the WWE did during Wrestlemania. There are already talks of using the SAP Center to stage the Super Bowl Media Day. Best of all, these benefits are coming to San Jose for free. Heck, SJSU is even getting a Football locker room upgrade out of this. Fortunately, San Jose is planning to take full advantage of the situation. Our awesome Downtown Ice Rink in the Circle of Palms will be extended through February 7th and a "party zone" will likely be created Downtown for fans. Who knows, by the next time a Super Bowl is hosted at Levi's Stadium, Santa Clara and San Jose might fully become the official host cities with the auxiliary events in SF.